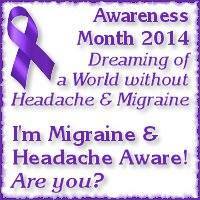 It’s Day 5 of Migraine and Headache Awareness Month. As if I didn’t know that already, my body decided to highlight this fact by giving me a wickedly intractable migraine for the last week. In between short bouts of moderate pain and extended bouts of severe pain, I’ve attempted to keep blogging and Facebook posting but it’s not been an effort I’ve been able to be proud of. I’m extremely frustrated and angry and sad that migraines are impacting my ability to do the advocacy work that I am so passionate about. It is my great hope that I will wake up feeling better and be able to resume my advocacy work but I wanted to write a short post letting people know that I have *NOT* abandoned my efforts. Today, I got intramuscular injections of Toradol (a high-powered NSAID), Zofran (an anti-nausea drug), and Depo-Medrol (a powerful steroid) at my doctor’s office. I did manage to throw on a purple shirt and my purple ribbon before I left the house, so that was my attempt at advocacy for today. At home, I took Dilaudid (a narcotic pain reliever), Benadryl (an antihistamine), and Prednisone (an oral steroid.) I am being referred to yet another neurologist for a fourth round of Botox treatment that my insurance company may not even approve. I write this not to garner sympathy but to give a short glimpse into a relatively average day in the life of a migraine-sufferer. I must retreat into my migraine cave (a dark, air-conditioned, silent room) but I wish all of you the best and hope everyone is having low/zero-pain days. I know you are trying, baby, and I am so proud of your efforts. They are Herculean, showing strength, courage, and commitment! I think you did a great job to support the cause today and I hope tomorrow (or rather today – it’s 2:48am in my part of the world – slept most of the day due to a whammy so I’m wide awake now :)) is better for you.